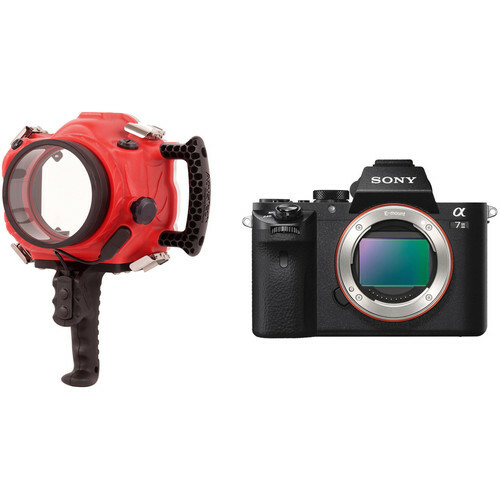 Capture 24.3MP photos and full HD 1080p video underwater with this AquaTech Base A7 Series II Underwater Sport Housing and Sony Alpha a7 II Mirrorless Camera Body Kit from B&H. The housing is depth-rated to 33 feet, features a pistol grip with focus and shutter buttons, and has a side handle for a secure grip. The camera features 5-axis SteadyShot INSIDE image stabilization, a full-frame Exmor CMOS sensor for high-resolution images and low-light effectiveness, and a BIONZ X image processor for fast processing and operation speeds. Once you grab your favorite lens, the appropriate port, and a strobe or video light, you'll be ready to start your dive. Capture photos and video over, under, or near the water's surface with your Sony Alpha a7 II, a7R II, or a7S II mirrorless camera in this AquaTech BASE A7 Series II Underwater Sport Housing. Featuring a depth rating of 33', AquaTech housings are designed for shallow water and surface use, and shouldn't be operated at depths beyond 15' for longer than five minutes. The included 2-Button Pistol Grip Trigger enables dedicated focus control and shutter operation. Zoom control is enabled with optional zoom gears for applicable lenses. The remaining camera functions must be preset or automatic, as there are no controls for them on this entry-level housing. For those looking to get started in underwater photography or video recording and seeking a simple solution, this housing fits the bill. An optional bulkhead sync connector, supplied with the optional AquaTech Strike flash housings, enables the BASE A7 Series II to work with external strobes and Pocket Wizards. Housings are available for various flash units. The BASE A7 Series II has an ergonomic design with a side grip handle. Its body is crafted from durable polyurethane, while smaller parts are made from stainless steel and anodized aluminum for resistance to corrosion. The O-ring and quick-release clips with safety latches ensure a watertight seal. Additionally, a standard threaded mounting point at the bottom of the housing enables connection to an optional tripod or tray. The housing is compatible with AquaTech's full range of interchangeable P series ports for various lenses, and includes the P-65 Lens Port, which accommodates an array of lenses with a maximum length of 63mm. For full compatibility information, see Port Chart. Box Dimensions (LxWxH) 13.2 x 10.3 x 6.2"
Box Dimensions (LxWxH) 8.268 x 6.221 x 5.433"